Identification: The Phantom Blindcat lacks eyes and is pinkish white. The dorsal fin lacks a spine. The snout overhangs the mouth. There is a long adipose fin joined to the caudal fin but with a flap posteriorly creating a deep notch between the adipose fin and caudal fin. There are 17 caudal rays and 17 rakers on the first gill arch. The caudal fin is weakly forked. There are well developed lateral-line canals and pores on the head. To 2 1/2 in. (6.8 cm) total length. 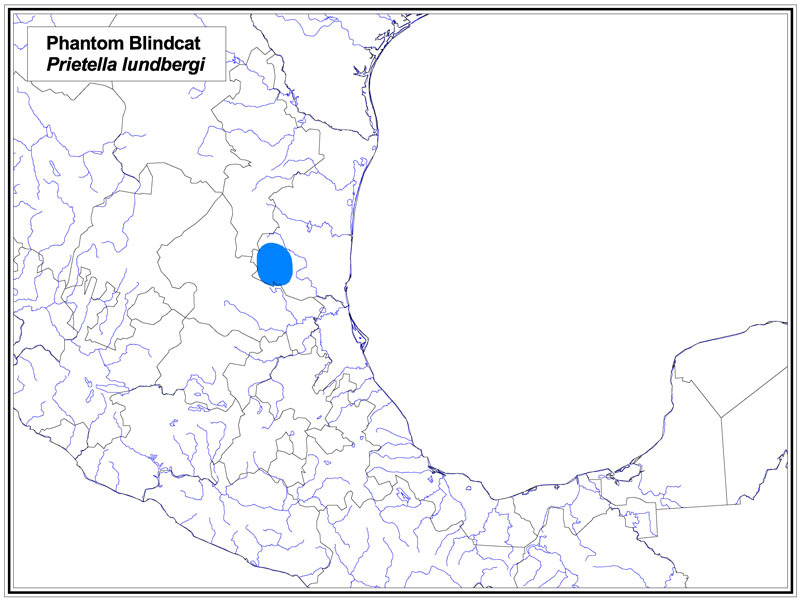 Range and Habitat: The Phantom Blindcat lives in subterranean waters in the Rio Tamesi drainage, Tamaulipas, Mexico. It is known from only two caves and presumably lives in deep underground aquifers. Similar species: The other blind catfish in Mexico, the Mexican Blindcat, P. phreatophila, has a straight-edged caudal fin, 15 caudal rays and 10-14 rakers on the first gill arch.